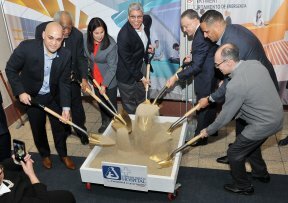 Norwegian American Hospital held a groundbreaking ceremony to initiate its newest phase in the development of the hospital, a first-floor transformation project. “We want to provide our patients with a facility that will enhance our ability to provide the highest-quality medical care not just today, but for the next generation,” says President and CEO José R. Sánchez. “Today, it’s clear that we turned the corner on the transformation of Norwegian American Hospital. We accomplished goals that were set when I arrived six years ago. We can point to progress in almost every area where we needed to see improvement,” Sanchez emphasized, who is currently the first Latino President of a hospital in Chicago and in the State of Illinois. For nearly 120 years, Norwegian American Hospital has been providing healthcare services to the people of the Humboldt Park community. The transformation will enable healthcare practitioners to better serve patients. NAH is investing more than $5 million dollars in the health of the community through the construction of a new modernized emergency department with a ‘Fast Track’ program’ to treat an additional 5,000 patients a year. There will be an extended residency clinic for the new Family Medicine Program which will begin in July to meet the needs of a growing community and to ensure higher levels of patient care and service. In addition, the renovations will allow Corporate Health to expand and meet the high demands of businesses within the community. This project is scheduled to be completed in 2018. Several local elected officials were present at the event supporting the improvement project such as Congressman Danny Davis, State Comptroller Susana Mendoza, State Representative Cynthia Soto, and Councilman Roberto Maldonado, among other important officials. Also in attendance was the multi-prized and renowned architect Juan Gabriel Moreno of JGMA who will oversee this project and Skendor Construction. “We want everyone who enters the first floor of the hospital to feel a sense of hope, dignity, and a more comforting future,” said architect Juan Gabriel Moreno. “All of this will be accomplished by using color, light and 100 percent recyclable materials, all in efforts to transform the experience patients have within the building,” claimed Moreno, who oversees the renovation. Visit www.nahospital.org for more information.